I have been fascinated lately by probiotics. They are so very important to overall health and I can’t seem to get enough of them. I hate spending $10 on the really good, fresh, organic kimchi and sauerkraut when I’ve been eating some with every meal. It breaks the budget. I began looking into my own fermented veggie recipes and I’m pleased to announce success in both kimchi and sauerkraut. The kraut is much easier to make, so I’ve included that recipe below. As we live our lives, external pollution, toxins, poor food choices, and antibiotics (“against life”), can harm our friendly microflora. When the good bacteria dies, it leaves plenty of open housing for the hostile bacteria. When the hostile bacteria outnumber the friendly bacteria, we experience problems like poor digestion, constipation, gas, bloating, and lack of nutritional assimilation. It’s bad, people. Bad. I’ve been eating some form of probiotic before every meal — or at least once a day — for the past month and I notice a difference. I’ve been experimenting with recipes and have developed a really simple herbed sauerkraut recipe that is delicious and can be tailored to anyone’s taste. Enjoy! A bit of cheesecloth and an elastic, or a thin cloth. Something permeable to air, but not dust. When fermenting, everything must be super clean. Think canning kind of clean. We don’t want any foreign bacteria outside of the good ones present. Wash the containers, the cabbage, and the herbs. 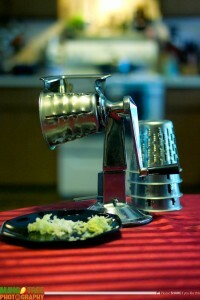 Grind the cabbage. 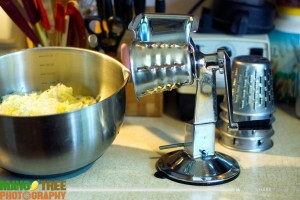 I used my manual food processor. You can use whatever machine you want, or just a knife. I have an approximation of the size of the cabbage bits in the picture. Smaller pieces saturate faster. 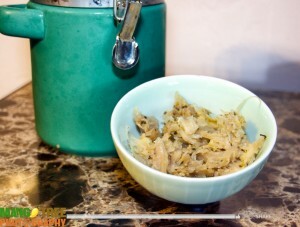 Kimchi uses larger cabbage pieces and takes a bit longer to ferment. I put all my ground cabbage into a big bowl. The bigger the better. We’re going to play in the cabbage with our hands before we transfer it into the fermenting jar. To the pile of cabbage, add the sea salt. Make sure your hands are super clean, then dig in and massage, squeeze, and knead the salt into the cabbage. You can be rough. The cabbage will start to go limp — keep kneading! The cabbage will start to produce its own water — keep kneading! It’s about 5-10 minutes. I put on some good music and had a blast. The goal is to have enough water produced that it will cover the cabbage in the jar. If you feel you don’t have enough, add more sea salt and keep kneading! When you have achieved well-soaked cabbage, add in your herbs and/or spices. In my picture, I used some fresh oregano from my deck. It’s really tasty. I can’t think of any herb or spice that wouldn’t work. I’m thinking of a curry kraut for autumn. Experiment, have fun! There are no measurements here, just add until you think it will be enough flavor. I probably threw in a good handful of fresh oregano. Pack your beautifully flavored cabbage into your jar. Tamp down the cabbage until the water covers it. I laid cheesecloth over the top and secured it with a rubber band. Put the jar in a corner of the counter where it won’t be disturbed, yet has plenty of airflow. Every day for the next 3-5 days, lift the cheesecloth and tamp down the cabbage. By day 3 or 5, you should see bubbles. It’s fermenting! I waited a full 5 days before taking off the cheesecloth, locking down the actual jar cover, and putting it in the back of the fridge. I left it there for an additional 5-7 days. When I took it out a week later, it was sauerkraut! It’s pretty simple. Since I want to keep myself in probiotic veggies, I have been starting a new batch every other week. By the time one of my jars is free, I’m ready to make more. I keep the kraut in the fridge and just pull from the big jar. Be sure to always use a clean utensil in the big jar so you don’t introduce harmful bacteria to the main batch. It’s fun to make, it’s tasty to eat, and it’s good for me! Win, win, win!